Is It Time For A New Run Out Song? Rotherham United were more or less given a run-out song when the new ground was named the New York Stadium and every game we come out to the crooning voice of Frank Sinatra singing ‘my way’ – no, only kidding, of course we come out to ‘just spreading the news ….’ which is the beginning of ‘New York, New York’. Very apt and an obvious choice. You can’t deny it’s a great song. When every Miller in the stadium at Wembley got to their feet singing it it sounded tremendous. At the ground most people sing bits of it, some of us wave our arms and scarves around to it but there are those who just stand/sit there not even bothering to mime the words. You can’t deny it’s a great song. When every Miller in the stadium at Wembley got to their feet singing it it was great. But, is it time for a change? Over the years I’ve heard some really good entrance songs. Of course, Liverpool will only ever arrive to ‘You’ll Never Walk Alone’ while their neighbours Everton run out to the Z Car theme (which I’m sure more than half of their supporters never saw the TV programme!) And don’t Watford use it too? Enter The Dragon is another I’ve heard over my years of supporting the Millers away, though not quite sure where it was. MK Dons have come out to the Guns and Roses song ‘Welcome to the Jungle’ while West Ham are ‘Forever Blowing Bubbles’. Personally, I wouldn’t like to get rid of Frankie completely and we could play it when the game as finished but I’d like to hear Canned Heats ‘Together We Stand, Divided We Fall’ which I know we played at Millmoor as the players come out of the tunnel. The words of ‘Together we stand, divided we fall, Come on now people, let’s get on the ball and work together’ I feel are very apt. Or, as a friend suggested, why not have Dave Clark Five’s ‘Glad All Over’ adding our own ‘Warniola’ as we do now? But what about you – what would you like to hear or are you happy with New York, New York? 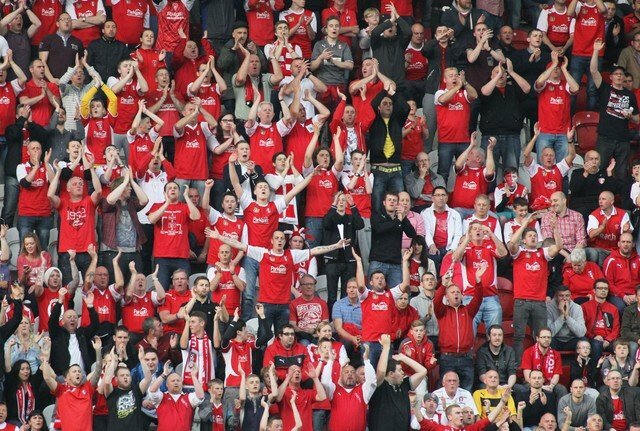 And if you’re not a Rotherham fan what song do your team come out to? Sounds good, Johnny. We might have to send these comments to the club. The New York groove by the 70s band HELLO would be a good one to get the fans singing along to the chorus line ‘ I’m back, back in the New York Groove ‘. If you don’t know it try YouTube music. It would also get the fans clapping in time. It would be great to hear it as the players ran out to it against the Blades on the 24th as it will be my 60th birthday ! Good one, Baz. And have a super birthday!